Unless you’re a good lookin’ dude (like Pip Surfer – holler!) who’s trying to win over his lady crush, never make the first move. What we mean by this is that you shouldn’t always jump in when you see the market moving so quickly. Dealers know that, about 80% of the time, markets are ranging. This means that sharp and sudden moves are most likely to be faded. This represents a good opportunity for dealers to make some profits. First of all, why will it most likely be faded? Remember, dealers work for banks, so they’ve got two “advantages” (more like tricks if you ask us!) up their sleeves. First, they can see the orders that retail traders have and want to take. Secondly, they’ve got a ton of cash to help back them up and move the market. Let’s take a look at a chart to see how dealers can use these tricks to their advantage. 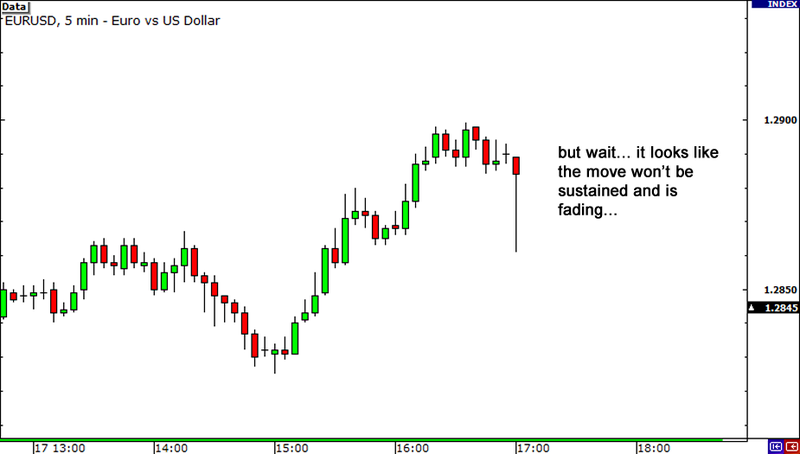 Below is a 5-minute chart of EUR/USD. Here we see that the German ZEW economic sentiment index, a high impact report, has just been released. Retail traders are looking at their charts and see that EUR/USD is dropping, so they decide to get in on the action. They figure, “It’s looking pretty good. EUR/USD just dropped 20 pips in the last 5 minutes! But wait, that’s what the average retail trader is thinking. What are dealers focusing on? Dealers know that the release of data normally causes spikes in price as traders are jumping in and out quickly. They also know that most of the time, the first move after a news event is a fake out and that price normally REVERSES to levels before the data was released. What happens is that dealers, with financial backing of their respective banks and hedge funds, will take on the opposite position and fade the move. And since their collective efforts (cough… money…) outnumber those of us retail traders, our positions get stomped on like little, little ants. …all of a sudden, price reverses! And this is where the magic happens! 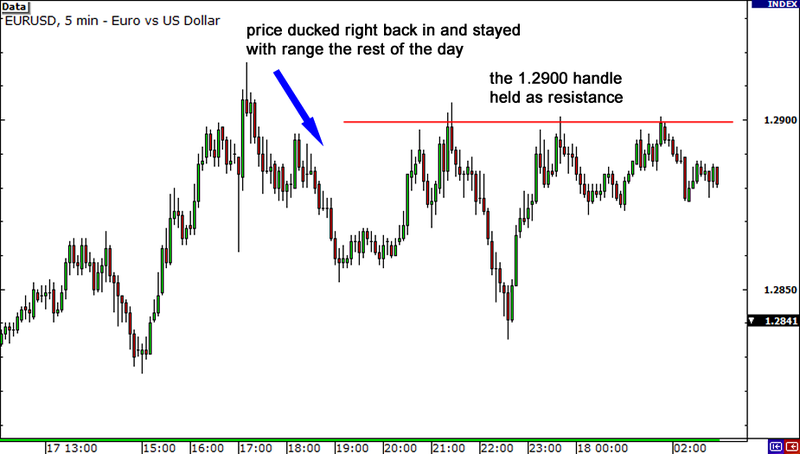 Chances are most people had set their stops just above 1.2900. In order to reach those stops, dealers probably took on even more buy positions using their own money in order to push price up to those levels (we’ll explain this more in detail later). Once retail traders saw that price was making a new daily high, they probably thought, “Oh man, this baby is gonna keep trading higher! I need to buy, buy, buy!!! *click, click*”. Now that retail traders have changed their mind and wanna buy EUR/USD, dealers can now take advantage yet again and close their former long positions, while making money off the spread! Ka-ching, ka-ching! But of course, the dealers, banks, and trading institutions are the true playas in the market! That’s why they are called market makers – they make the market move! Once all those retail traders get in their long positions, and place their stop orders below the 1.2900 resistance, dealers can once again make a run for those stops and make money off the spread! And will ya take a look at that! 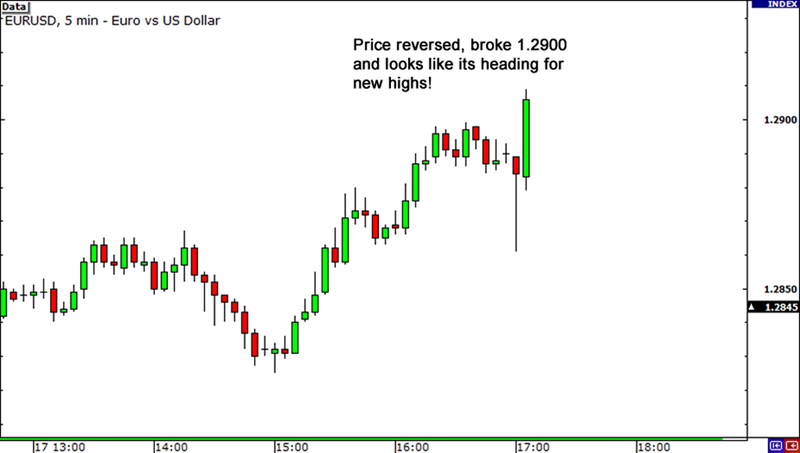 Price did trade a little bit higher, but then it faded and dipped back down under the 1.2900 handle. All those retail traders who decided to go long on the break for new highs probably had their stop losses hit. As it turns out, that 1.2900 resistance ended up holding the rest of the day. You can see here how dealers use their considerable advantage to move the markets in their favor! This is why you shouldn’t always go and take the first move as chances are, you might just get caught in fake out. Next Lesson Focus on the Process. Not on the Profits.